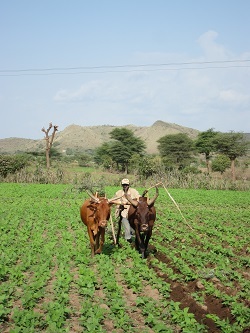 Ms Tracy Cull is currently in Ethiopia, visiting with haricot bean farmers and bean researchers outside of Nazareth, in the Rift Valley, to see how they are adapting to climate change. Agricultural adaptations are being assessed in six countries across Africa as part of a project managed by Kulima and UNIQUE Landuse and Forestry that seeks to identify agricultural adaptation best practices on behalf of the Comprehensive Africa Agriculture Development Programme. Different farming and commodity types were selected for further investigation at a workshop in 2013. The visit follows related ones to Zambia in April, Togo in May, and Burkina Faso and Cameroon in July. The final results of the study are anticipated in early 2015.